Bill is an old man. He likes to go to a restaurant for delicious food. There is a waitress who likes to serve him. Her name is Susan. She is always kind. She always gives him what he likes and how he likes it. If he wants something special, she makes it for him. Bill comes to this restaurant every day for many years. He doesn’t have a family and friends. He always comes alone. One day he calls his lawyer. The old man doesn’t come to lunch. Susan feels something is wrong with him. A lawyer in suit comes into the restaurant and asks Susan to go to his office. Susan says she doesn’t have time. She must work. He tells her to take some time off and go to the restaurant next door. Susan asks her boss to give her some time off. Then Susan goes out with the lawyer. They sit down at a table. The lawyer asks for a bottle of champagne. Susan says she cannot drink because she must work. The lawyer tells her that she will not have to work again. He tells her that he is Bill’s lawyer. Bill is dead but he left a will. 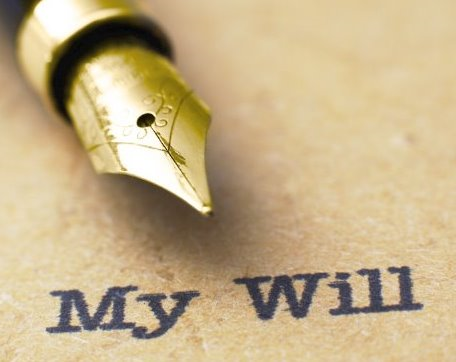 Will is the document which says who gets his money when he dies. She gets all Bill’s money. That’s millions of dollars. She opens her eyes wide in surprise. Now she knows why she doesn’t have to work again. She has a glass of champagne. 1. Bill likes to _______. 2. Bill always goes to the restaurant _______. 3. Who is NOT in the passage? D The boss of the restaurant. 4. The underlined word “will” means _______ in Chinese. 5. What’s the right order? ①Bill calls his lawyer. ②Susan asks for some time off. ③Susan goes out with a man in suit. ④Susan serve Bill in the restaurant.